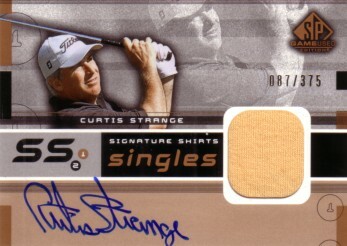 2003 SP Game Used Signature Shirts certified autograph card of two time U.S. Open Champion Curtis Strange, with a swatch of his tournament worn shirt. Numbered #87/375 on the front, with congratulatory message confirming authenticity on the back. With certificate of authenticity from AutographsForSale.com. ONLY ONE AVAILABLE FOR SALE.